PDF Studio comes with a PDF Overlay Comparison feature that allows to visually compare documents by overlaying a second document onto the first using different colors to display any differences. 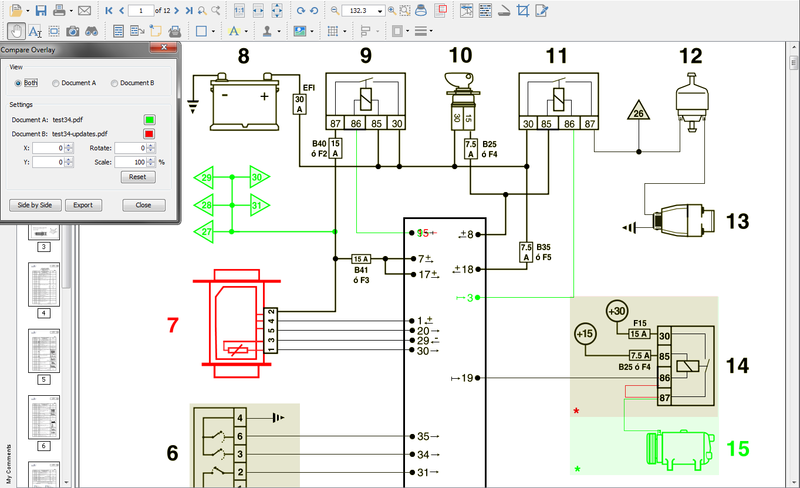 This feature was introduced in PDF Studio version 10. This feature is especially useful for architects and engineers to visually identify even small differences in architectural drawing and blue prints. It can be used not only to compare PDF documents but also scans, images or Word documents that have been converted to PDFs using PDF Studio. The overlay comparison is rendered live, making it very easy to perfectly align the 2 documents, moving a pixel up or down, by using the adjustment options provided. This is useful in the case of scanned documents, where position, rotation or scale can be slightly off from one scan to the other. In green are all the elements present in Doc A only. In red are all the elements present in Doc B only. In black are all the elements present in both Doc A and Doc B. Open the initial or first document in PDF Studio. This will become Document A (in Green) in the Overlay Comparison. Go to View -> Compare Overlay in the menu bar. You will now see Document B overlayed onto Document A and the Compare Overlay dialog that can be used to make any alignment changes to Document B (in real time) if needed to correctly match up the documents. Color – select the color of each document (the default colors generally provide the best results). Read our KB entry regarding Choosing colors for overlay PDF comparison. At any time during the comparison you can only annotate or markup any changes onto Document A. You can also switch over to our Side by Side comparison mode by clicking on the “Side by Side” button in the Overlay Comparison dialog. Once you’ve completed your comparison, you can export the comparison into a single document with the overlay as the base layer and Documents A & B as layers within the document. If you have completed your comparison and want to exit the comparison mode, just close the comparison tool to return back to Document A. The overlay comparison view will be rasterized (turned into an image per page) as the base layer. It is worth noting that all annotation and text markup tools, as well as other PDF editing tools, are still active while in comparison overlay view, allowing to mark up and modify the original PDF (Document A). One can also easily switch back and forth between the overlay comparison view and the side by side comparison view (where the 2 documents are displayed side by side in a synchronized way). In side by side comparison, it is possible to annotate the second document (Document B) to add sticky notes and text highlights (look under the right-click context menu).